Laundry day is never a drag for me. I love doing laundry (call me crazy) and find it very satisfying to be able to accomplish something in my day that I can physically see. :) When it comes to my laundry detergent, my favorite brand is Purex. I have tried just about all the Purex products that have been on store shelves and the variety has always amazed me! The scents are beautiful, the results are wonderful and the price is unbeatable. Purex always seems to be coming out with something new and this time, I am totally in love with the newest member of the Purex family. Being the huge Purex fan that I am, I was very excited to be included in the latest campaign for Purex Crystals Aromatherapy and try out this product. I knew it would be wonderful! So, for this review I was sent Purex Crystals Aromatherapy in the Energy scent. The brightly colored label and tantalizing pictures made me so very excited. Laundry day couldn't come quick enough. :) As soon as I opened the box, the aroma was fantastic and the bottle itself wasn't even open yet! Using these Aromatherapy Crystals is simple...just pour the desired amount into your washing machine (top, front-loading or HE) at the beginning of the wash cycle and let them work their magic! Honestly, I found that just a small amount yielded a nice scent for me so use whatever you prefer! The cup that comes on top of the container has handy measuring lines to help you with proper measurements. The Energy Aromatherapy Crystals smell soooo great. It is kind of like a citrusy/floral scent. When my clothes came out of the dryer, they smelled so great and even when they are put away, they still smell nice! I love how long the scent lingers. You can use these crystals on anything washable including children's clothing. I especially love using Purex Crystals Aromatherapy on my towels and sheets. Mmmmm...crawling into a bed with freshly washed sheets is an amazing feeling. Disclaimer: As a Purex Insider, I received no monetary compensation for this post. Purex did provide me a free sample of their Purex Aromatherapy Crystals for review purposes. All quotes and stock photos are from the Purex website and email. Prizes are in coupon form and will be mailed by myself. This blog is not responsible for lost, damaged or stolen prizes and in this case, I am not responsible for replacing coupons under any circumstances. All thoughts and opinions are 100% mine. I think the energy scent would be my favorite. Thank you. I would like to try the Energy scent. I'd like to try the energy. I want to try the Well Being scent. I want to try the energy purex crystals. I'm hoping it will give me more energy. I'm not sure which scent is my favorite - but I'd love to try the energy scent. I haven't gotten to try it yet, but I think energy sounds lovely. I love lavender in aromatherapy. 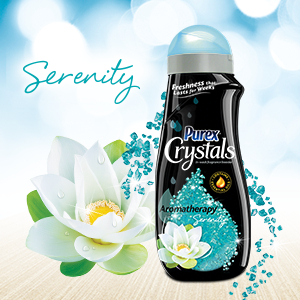 The Serenity Purex Crystals sounds like something I would like. I think the Serenity would be my favorite. I like the Serenity scent. My favorite is the energy scent! Serenity sounds like a scent that might actually make laundry bearable! I think I would like energy! I would like to try energy. I would like to try the energy scent! I need some Serenity in my life. I think energy would be my fave. I like the Serenity scent. It sounds so calming. I haven't tried any yet, but everyone is saying serenity so I would like to try that one. Energy is my favorite scent. I would like to try well being. I most want to try the Well Being scent.